We’re pretty fortunate that both of our children really enjoy bath time. Corbin would stay in the tub for hours if we’d let him. Lynley likes it a little less, but she still splashes around joyfully just long enough to get washed. 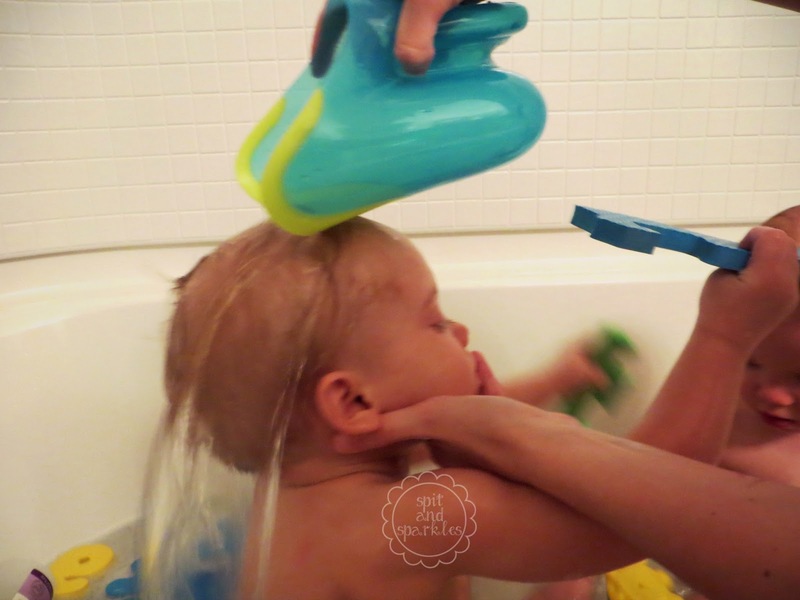 One of the things that makes bath time so much simpler at our house is the Tear-Free Rinse Pail from Nuby. It features a comfortable grip for mom, a deep, slender base for easy filling in shallow water and a unique tear-free edge. The tear-free edge is soft and contoured so it can be gently placed against your baby’s skin to help prevent water from running into your baby’s eyes while rinsing their hair. We use our pail on bodies and heads. Not only is it great for rinsing out shampoo, but for rinsing off soap too. And it doubles as a toy! Corbin and Lynley like to fill it with water and pour the water out, or fill it with water and let their duckies float up top. Our other Nuby product reviews on the Wacky Ware bowl, flex-straw cups/utensil travel set and grooming set can be found here, here and here. Too cute! I have a similar bucket that I love! Definitely keeps the water out of little eyes! Thanks for sharing on Whatever Wednesday on Thank You Honey!